Midfielder Glen signed for the newly-formed Rushden & Diamonds prior to their first game, making his debut towards the end of their first month of competition. He had started out as a youth at Aston Villa, before moving to Stamford Town and playing in the FA Vase Final at Wembley in 1984. He then had spells with Baker Perkins , Rushden Town and Grantham Town where he scored 32 goals in the 1987/1988 season. He signed for Boston United in the summer of 1988, before Kettering Town paid £10,000 for his services in February 1989. They released him back to Boston United 18 months later for half that fee, before returning to Stamford late in 1991. 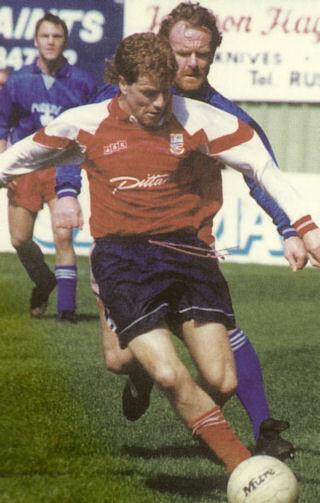 He became a regular in the Diamonds midfield during their push for the Beazer Homes Midland Division title, apart from a long spell out of the team in late 1993 due to injury. After two complete seasons with the Diamonds, helping them to win the coveted promotion, he was released. He went on to play for Sudbury Town, joining Corby Town in December 1994. He later had a spell wth Spalding United before retiring from the game.